November 2015 – Higher Purpose. Higher calling. Last year, our students wrote letters to their future selves at one of the first FCA meetings of the school year. The hope was that students would write how they hoped to grow closer to God throughout the year and make goals for themselves spiritually. For some, that meant writing down the things that God had taught them in their current season of life that they did not want to forget or stray from in the future. For others, it was just a fun reason to write silly notes to their future selves. A few examples of letters/envelopes students wrote to their future selves. So that is our challenge to you on this Thanksgiving break; write a letter to your future self! Whether it’s warning you or someone else not to drink the coffee, or reminding yourself of truths to encourage your future self; reflect and thank God this week for the faithfulness you have seen from Him this past year, and write a letter of encouragement to yourself for next year. One suggestion would be to do this on Thanksgiving day with your family and/or friends, and plan to open them next year; it might just become a new Thanksgiving tradition! I am 55 years old, married to my wife Stephanie for over 30 years and we have 4 wonderful children. We have three daughters named Kat, Alex and Ashtin. And…we have one son and his name is A.T.. Of our four children A.T. is the oldest. Speaking for myself I can honestly say that I have had many blessings in my life and am amazed at how God has showered me with so many undeserved gifts. Often times I take an inventory of these blessings and when I do I truthfully feel like I am the luckiest man around. I am truly humbled at how God has allowed my life to play out. It is Christ, his love, his death and Him saving me. Number two is the blessing of my wife Stephanie. She is beyond doubt the greatest Christian woman I have ever met and I am eternally blessed that in some crazy way I talked her into marrying me. Number three is my children. They are all beautiful like their mother and they are all God-centered young adults and could not have asked God to give me anything more. Number four. The IDEAL Program, and the opportunity it provided for my son A.T. Bank to attend Lipscomb University. 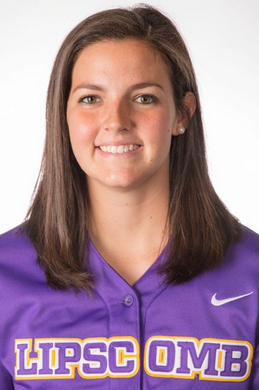 Three years ago my daughter Alex came to Lipscomb University on a basketball scholarship. I loved the way the Lord directed her to Lipscomb because it was my alma-mater and where I played college ball as well (plus I met Stephanie there)! During Alex’s freshman season my wife got a call from Lipscomb and began talking with her about trying to get a grant from the State of Tennessee regarding the IDEAL program which allows special students to come to Lipscomb and attend classes as well as teach them job skills that they can use later in life. Well, the grant came through and my son A.T. was one of three students to be in the IDEAL PROGRAM the first year. As a father, I thought it would be good for him because he could actually learn job skills that obviously would help him in the future. Also, I thought it would be nice to have him on campus with this sister Alex. That’s about as far and as deep as I viewed it. I was more concerned with getting A.T. to school and home each day knowing that due to rush hour traffic both ways was about a 2 ½ hour turnaround. And, I realized my wife was going to have to do most of this heavy lifting in this area due to my work schedule. God had a different view. Within a week of A.T. being at Lipscomb I started noticing changes in our son. The biggest change initially was no matter what time of the day or night it was…he looked like a walking “grape”. He would wear Lipscomb PURPLE from the time he got up until the time he went to bed. He wore a purple hat, shirt, shorts, socks and even purple high-tops every single day. However, the change in our son ran deeper than the clothes he wore. He started talking and acting different and his demeanor around the house changed dramatically. When I would talk to Alex, I would ask her if she saw A.T. that day and she would say “Sure, I saw him. Chandler and I were walking across campus and we would watch A.T. walking to class and he could not take 3 steps before different students would stop him, talk with him, give him high-five and move on”. My perception was that it was A.T. was probably stopping students that passed him, talking their ears off, making them late to class, etc., etc, etc. In all honesty…I was certain Alex had it wrong. 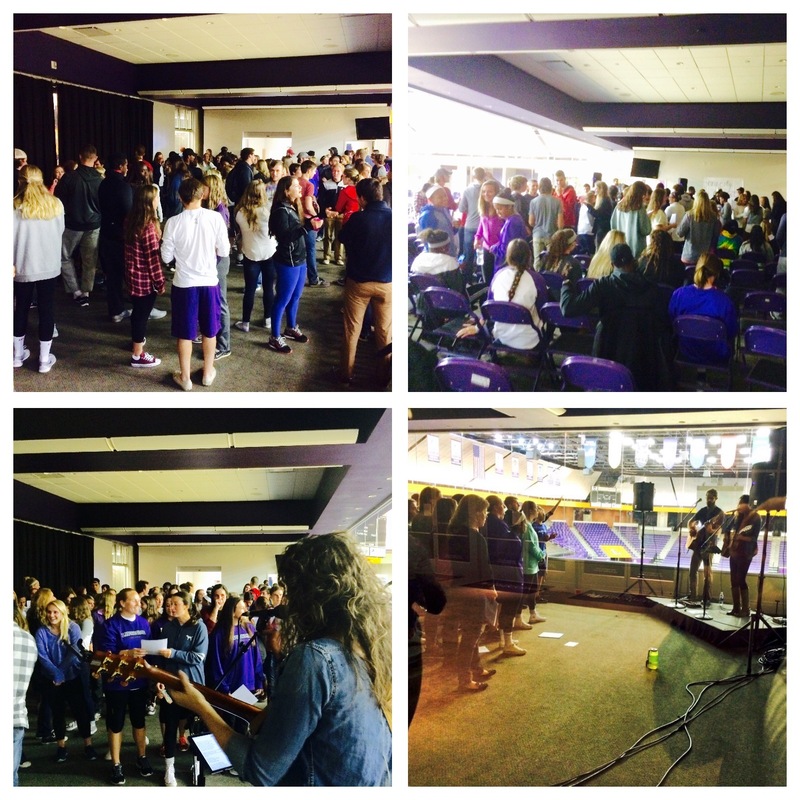 Over the past two years, my wife and I marvel at how God has used Lipscomb to benefit A.T.. This has not been a game-changer. It’s been a life changer. It has permanently changed our son…and me. Where else could a young man like A.T. go to school and be 100% safe? Where else could our son attend school and have the Women’s basketball coach AND the Men’s basketball coach both ask if he wanted to be a part of their staff? Coach Greg Brown and Coach Casey Alexander are held in the highest esteem with me because of their interest in molding his life for the better. Where else could our son go and have students call him during school as well as over the summer break and take him to dinner and a movie? Where else could our son go and be invited by one of the social clubs to do Singarama with them…and win? Where else could our son go and be befriended by the Head Baseball Coach Jeff Forehand…and he in turn make sure he has the correct baseball attire each and every year? Where else could our son go and have a birthday party and everyone from Lipscomb takes the time to come? Nowhere else. Nowhere else but Lipscomb University. 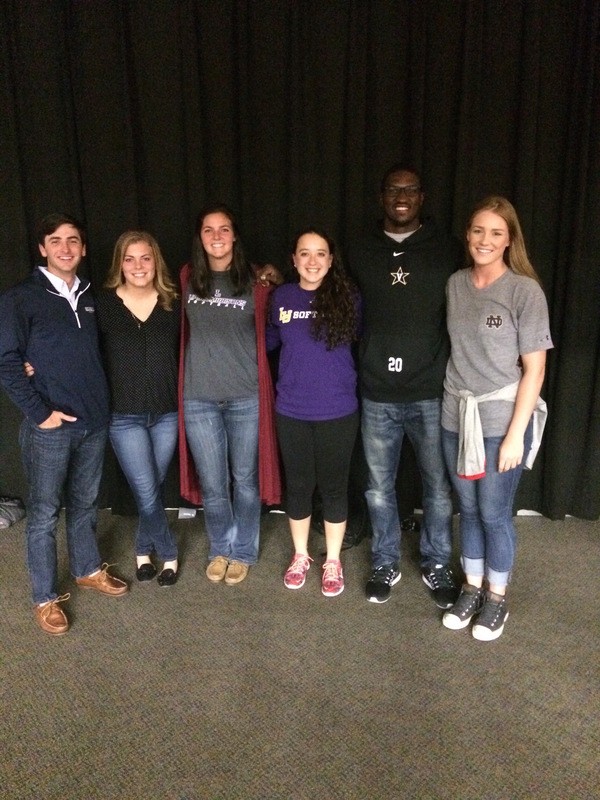 Again, we thank God that A.T. has had this unique opportunity to attend Lipscomb. Additionally, we thank the Students and Faculty of Lipscomb University for showing love in ways our son has never seen in his life. A.T. Banks Lipscomb’s Number 1 Fan! It made sense. Two schools less than a mile down the road from each other had every reason to come to together. We also acknowledged that with Belmont having moved conferences, the intense rivalries between many sports no longer existed. Hindsight, God’s hand was in the entire process, but this was when it became evident that he was starting something. Taylor Neuhart, a junior pitcher on the softball team, has a good friend on the football team at Vanderbilt, and I (McCarley) have a good friend who plays golf at Belmont. There were our connections. Soon Taylor and I found ourselves in a coffee shop on 21st avenue with two or three student athletes from each school trying to figure out if this was something they were even interested in pursuing. Much to our joy, they all were. A few plans were made, a group text was created, and what was once a conversation started to become a reality. The next few months involved a lot of planning and figuring out what exactly we as a group wanted this “Nashville FCA” to look like. Very quickly, as the fall always tends to go, November 10th arrived and the hall of fame room was ready. I would like to think in this moment that the leaders from the other schools shared the same apprehension that Taylor and I shared. We had hoped, prayed, and advertised for weeks, but reality rested in the fact that we had no idea how many students would actually show up for this night. Last Tuesday, 7:30pm rolled around, and all I can say is God is faithful. God blew past all of our expectations as car load after car load arrived bringing in more student athletes than we could have hoped for. Even the leaders for the other schools were surprised by the numbers from their own schools that continued to pour in as the night went on. McCarley & Taylor explaining the “shoe game” at the start of the evening. 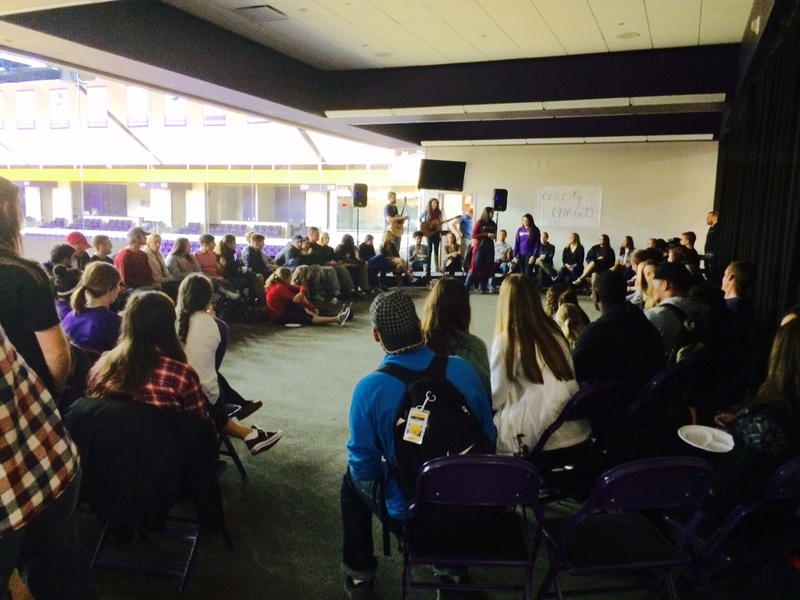 At the beginning of the night, everyone was playing the “shoe game”, a staple at Lipscomb’s FCA. The game is the best kind of mass chaos. Basically everyone takes off one shoe and throws it into the middle of the circle; from there everyone is asked to go find a shoe that is not theirs and find/return it to its rightful owner. It pretty much forces everyone to get up and mingle, meeting as many people as they can in an allotted amount of time. Somehow in the crowd I found myself beside Taylor. We looked at each other, looked at over 100 college athletes packed into our hall of fame room, and shook our heads in quiet disbelief. It started as a conversation. 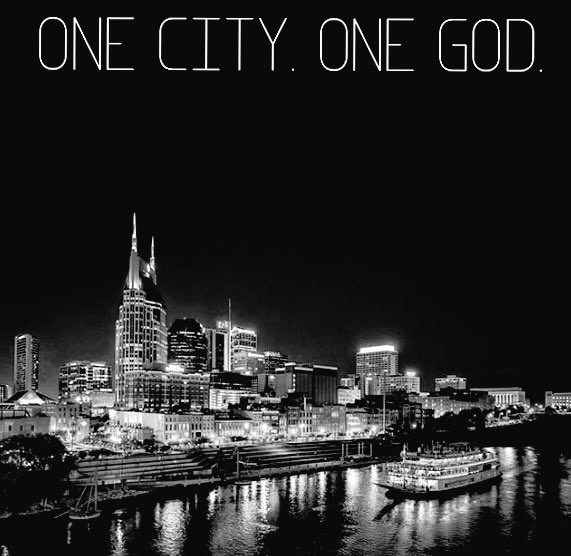 God took that conversation and created a beautiful new avenue for young men and women to grow in HIS name in this city. For the next three hours we mingled, we worshiped, and we listened to a great lesson from our Director of Spiritual Formation, Chris Klotz (Klotzy). More than anything we were encouraged. We were encouraged by the power of our God, encouraged by the number of God’s people who live in such proximity to one another, and encouraged by the realization that we are not alone. We left that night knowing that we have so many companions not only as student athletes, but also as children of God. The conversation is staring again, and I cannot wait to see where it leads. The spring after my final collegiate soccer season at The University of Kentucky, I was driving home from coaching my club soccer team. After years of studying and months of preparing to apply to Physician Assistant schools, I knew that a curve ball was coming at me. On the road that evening, I started to realize something significant: coaching is influence. Graham’s words began to make sense to me on that cool spring night. 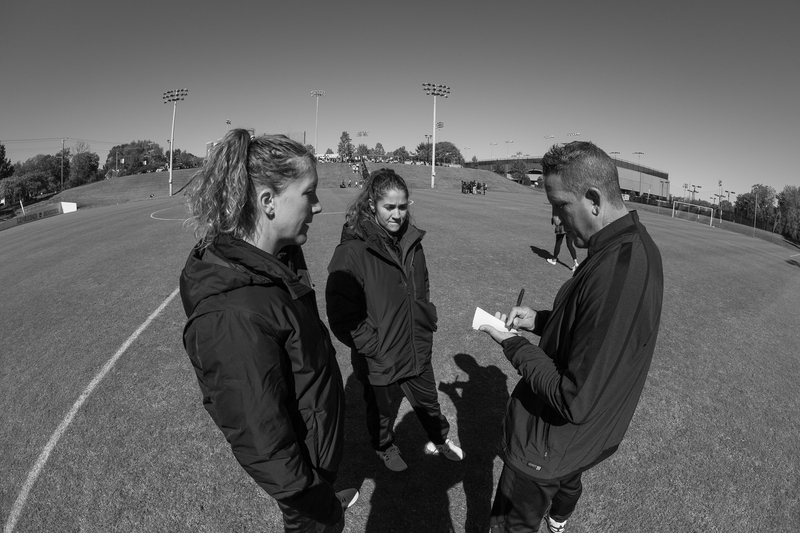 I was coaching a team of 15 and 16 year old girls who listened to every word I said, whether it was about soccer or life. I wondered why these girls trusted me and how I arrived at a place of such influence. I found the answer in a soccer ball. I could play and teach soccer, which gave me a door into their lives. I was amazed that less than a year and a half earlier, Jesus showed me the truth of the gospel. He showed me the desperate state of my heart and saved me from myself and I began to intentionally follow him. I had spent nineteen years of chasing after things that, ultimately, did not satisfy and did not give me the love and affirmation for which I was looking. I was empty. I was lost. It was exhausting. Jesus reached down and wrecked me with His grace. He filled me with a joy that I had never even come close to. He melted my heart to actually see & serve the people around me and to realize that life isn’t all about me. Rewind back to my car ride home from practice. I slowly realized then that I wasn’t going to PA school. Soccer is a gift. God gave me that ability to compete at a high level and he gave me the passion to want to teach the game to others. I fought coaching at first, thinking I was supposed to go into the medical field. However, I knew in my soul I was made to coach. I don’t want to be a good coach. I want to be a great coach. I don’t want a good soccer program. I want a great soccer program. I want to coach with integrity, humility, and grace. Things that seem contrary to the world’s definition of success & competition. I wonder what it would look like if college soccer players were no longer motivated by fear. Fear of failure. Fear of success. Fear of what others will think. What if they were motivated by something completely upside down? I dream of what it would look like for players to be motivated by grace. High standards. Competing hard. Failing hard. And a lot of grace. If I’m being honest, I still don’t know how to carry out my vision for coaching. I fail more than I want to admit. There is freedom as I’m brought to a place of humility and I am reminded that this has nothing to do with what I say or do. Coaching has everything to do with the way The Lord uses relationships to change the world. After all, that’s what the Lord desires with us: relationship. So he uses us as agents of grace to show people who He is by the way we love, by the way we live with integrity, by the way we fight for reconciliation, by the way we fail, by the way we forgive, by the way we live authentically, and even by the way we coach. 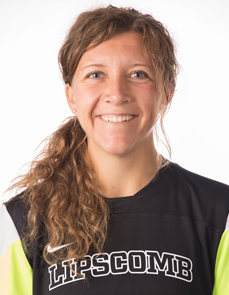 Kelsey Fenix is the Associate Head Women’s Soccer Coach at Lipscomb University. The team this season went 12-4-4, and finished the season playing for the Atlantic Sun Conference Championship. More than the team’s success on the field, Kelsey and the women’s soccer staff would tell you, it was the relationships off the field as a team that made this season so special. The playground rules still apply when you’re in college. That boy with the charming smile who picks on you a little too much — yeah, he wants to take you out. Or that girl with the enchanting smile who touches your arm after every sentence — yeah, she like you back. OK, so maybe just one playground rule still applies when you’re in college. Because let’s face it — relationships in college are a lot more complicated than holding hands, sharing a juice box and spinning on the tire swing. Let’s face it — we should be seeing #RelationshipMess as often as we see #RelationshipGoals. God created us as beings who long for community, who long to be fully known. Yet, we are imperfect and broken people. That hole you feel in your heart, that desire to be fully known and fully loved cannot be filled by someone here on earth. That hole is filled with God, no one else. Until you accept that a relationship with God is the only way you can be made whole, you will struggle to turn your #RelationshipMess into a #RelationshipGoal. Being in any relationship is about being vulnerable. If you are a friend, more-than-friend or in a relationship your flaws are going to be exposed. That little “quark” they once found cute is going to turn into an annoying habit. That is what makes relationships scary and exciting all at the same time — being fully known by someone else. Dudes, us girls don’t make it easy on you. We want you to sweep us off our feet when you ask us out. Be Prince Charming, he is in all the Disney movies after all. Girls: Be vulnerable and be OK with letting that guy know you like him too (because, lets face it — we can usually tell). Guys: Man up. Ask her out! Ladies and Fellas… make sure you are praying over your relationship individually. Guys, she wants to be pursued. If you feel led by God, pursue her! Ladies, if you feel led by God, let Him pursue you! So what is the most important thing when planning that first date? Keep the time on your phone to a minimum. You asked her out, now be with her, not Snapchat. Don’t go to the movies, you don’t learn anything about someone from a movie. Find an activity you both like. Try skating, bowling, hiking. If the conversation is lacking or things just aren’t going the way you wanted you have something else to do during the rest of the date. After a few dates you may get to that conversation referred to as “Defining the Relationship.” Oh, scary. It all goes back to being vulnerable. Communicating is being vulnerable — and that is the key to a healthy relationship. Remember, individually leading your life in Christ is so important both as a single person and as a person in a relationship. Don’t be fooled to believe that you are missing your other-half — you are missing a Savior. And a relationship with your Savior should be your first #RelationshipGoal. After awhile someone is going to be thinking about the four-letter word. … Love. I can’t define earthly love here for you. I can say with certainty that the love our Heavenly Father has for us is true love. God calls us to love like Him — and as we learn to love and look to Him for guidance, we will mess up on the way, but it is through this that we grow. There is a lie in all those chick-flicks that my pastor Pete Wilson has pointed out to me… “that there is only one person for everyone.” (But what if someone picks the wrong person?) The domino effect begins and no one is with “the one.” If love was fate, if there truly was only one person for everyone when our #RelationshipGoal becomes a #RelationshipMess we have a great excuse — you are not ‘my One.’ This is a loop-hole in our culture. The truth is, God gives us the freedom of choice. God desires us to prayerfully consider our mate, and to be intentional in seeking them through Him, with a Christ centered perspective (and this doesn’t stop once you’re married). Each day when I wake up I choose to love my husband. Some days he makes it easy, some days he makes it hard. And I know he would say the same thing about me. Two broken people don’t make a whole person. When two people choose to be in a relationship, friendship or dating, it is going to be imperfect, because there are two imperfect people operating within it. With God at the center of the relationship the choice to love each other every day is easier (not easy — just easier). Through prayer and a relationship with God we are able to love each other well. The author of Ecclesiastes writes, “A three-stranded rope isn’t easily snapped.” A relationship with God at the center can get through those #RelationshipMesses. Ali Lopes and her husband Vinnie were part of the FCA panel on Tuesday, November 2nd. Ali works at Cross Point Church as the Creative Arts Coordinator and adores every minute of it. Her husband Vinnie is one of the broadcast announcers for the Lipscomb women’s volleyball team. Vinnie and Ali started dating when they were sophomores in college and they have been married for 2 1/2 years. You can find Ali and Vinnie on Twitter @alilopes and @vinnielopes. Imagine that you and your family, after losing your property, are taken to and left in a foreign country that will become your permanent residence, with no hope or potential of returning to your homeland. You are forced to leave all you know behind to come to a place where your lack of knowledge is crippling. You don’t know anyone outside of your family, and you don’t even know the language. As a result of this, you encounter countless adversities, as large as having no idea how to get a job, to as small and simple as not being able to read your mail. In the midst of your immense despair, you don’t even know where to go to ask for help. Now imagine that you are a child, only six years of age, experiencing all of this with your family. This state of hopelessness is reality for the thousands of refugees living in Charlotte, North Carolina, and it is reality for a certain helpful six-year-old named Mimi. 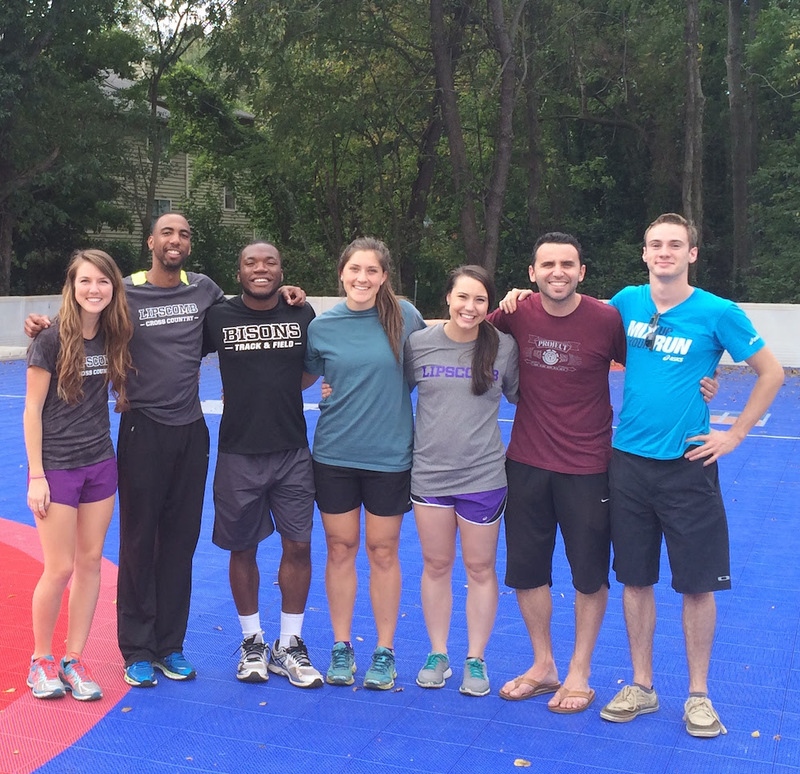 This fall break, Lipscomb Missions excitedly launched a new mission trip, taking a small team of Lipscomb athletes to Charlotte where they partnered with a local non-profit sports ministry serving the refugee population of the city. The small team of seven made their way to the Queen City to join forces with Project 658, an organization that exists to restore hope to the abundant population of refugees in Charlotte. Project 658’s unique ministry begins with a ball and a sports court. This simple combination draws in the kids of the refugee families, and by forming friendships through playing sports, Project 658 is able walk into discipling these kids. Empowered by this mentorship, the children are then able to transform their families, and eventually, transform whole communities. Since Project 658’s strategy begins with kids, it’s only fitting that the team’s most memorable experiences are the moments they shared with Mimi. Even though Mimi has experienced the harsh brokenness of the world as she lived in a refugee camp and had to literally run for her life before her family found their way to America, she simply wanted to praise God. The enemy would have loved it if the Lipscomb team and the various refugee families could not communicate, but through the mouth of a child both the refugees and the team were able to experience heaven. Senior track runner and team member, Gemikal Prude, shares,“God showed His love to us through the community we experienced when all these nationalities were loving each other.” In that space, every knee bowed and every tongue from all of these nations professed Jesus as Lord! 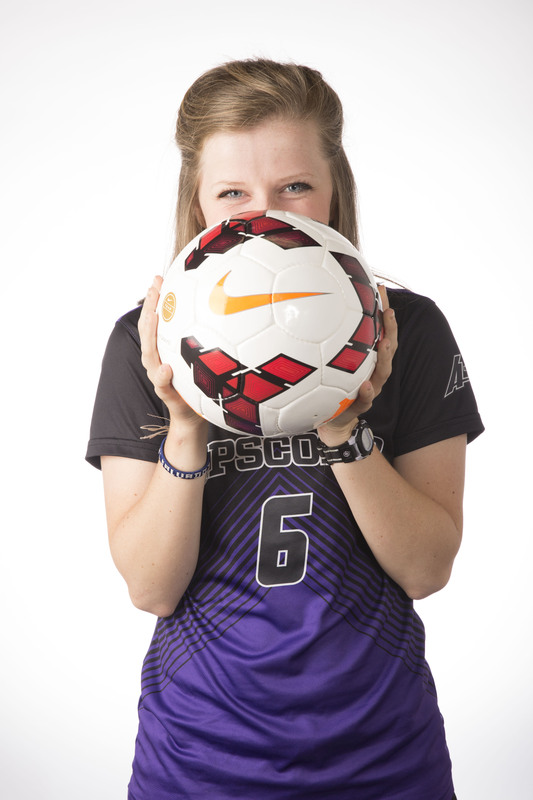 Emily Shuler is a senior on the Lipscomb Women’s Soccer Team, and is a Student Ministry major.